The top of the root ball should be sticking out of the ground about 2 after planting. The bottom of the root ball should be sitting on firm undisturbed soil. When you over-dig and have to put backfill under the ball, the tree can settle. 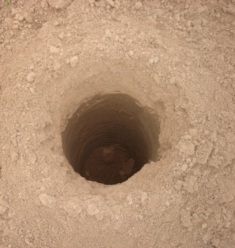 THIS IS A COMMON CAUSE OF ROOT FLARES BEING TOO DEEP IN THE GROUND. If fill under the ball is unavoidable, tamp the soil to compact it before planting. If you set the ball too low in the first place, that can be even worse. It's best to set trees and other woody plants 2-3 higher than ground grade (even higher with larger root balls) to allow for settling and/or being planted too low. When time allows after digging the hole and before the tree is planted, fill the hole with water and wait until the next day. If the water level does not substantially drain away overnight, a drainage problem that would negatively affect most trees is indicated. 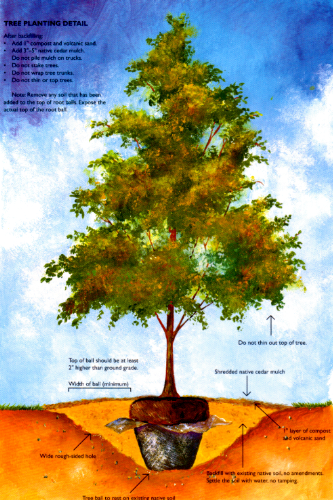 For wet soil-adapted trees like bald cypress and willows, this procedure isn't necessary. Positive drainage is critical, so do not shortcut this step. For soils where the water doesn't drain away well, spraying the sides of the holes with 3% - 5% hydrogen peroxide will help initial root establishment. Hydrogen peroxide is especially good for tree holes dug in hard clay soils. It loosens the wall of the hole and creates a more receptive surface for the tree roots to enter. Most trees are planted too deep in the ground. The root flare is part of the trunk and should be placed above ground. Remove burlap, excess soil and mulch from the surface to expose the true top of the ball. The top of the root ball should be slightly higher than ground grade. 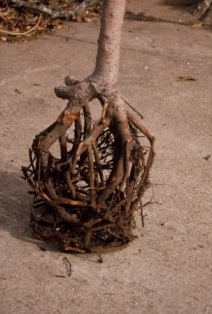 Remove the excess soil from the top of the root ball and remove the "bird's nest" or circling roots. Place the tree in the center of the hole, making sure that the top of the ball is slightly higher than the surrounding grade. Backfill with the soil that was removed from the hole. This is a critical point. Do not add sand, foreign soil, organic matter or fertilizer into the backfill. The roots need to start growing in the native soil from the beginning. 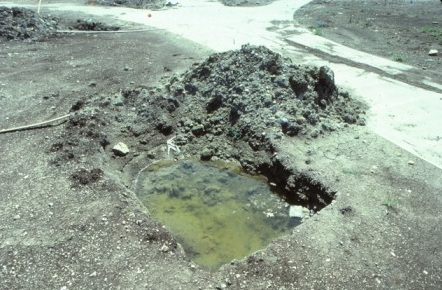 When the hole is dug in solid rock, topsoil from the same area should be used. Some native rock mixed into the backfill is beneficial. Adding amendments such as peat moss, sand or foreign soils to the backfill not only wastes money, but is detrimental to the tree. Putting gravel in the bottom of the hole is a total waste of money. When planting balled and burlapped plants, leave burlap on the sides of the ball after planting, but loosen at the trunk and remove the burlap from the top of the ball. Remove any nylon or plastic covering or string, since these materials do not decompose and can girdle the trunk and roots as the plant grows. Studies have shown that even wire mesh should be removed to avoid root girdling because wire does not break down very fast. When planting from plastic containers, carefully remove plants and tear the outside roots if they have grown solidly against the container. Never leave plants in containers. Bare-rooted, balled and burlapped as well as container plant materials should be planted the same way. When planting bare-rooted plants, it is critical to keep the roots moist during the transportation and planting process. Water the backfill very carefully, making sure to get rid of all air pockets. 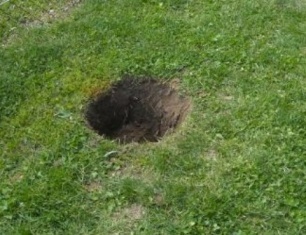 Do not tamp the soil or air pockets will be formed and roots will be killed in these spots. Trunks of newly planted trees should not be wrapped. It is a waste of money, looks unattractive, harbors insects and leaves the bark weak when removed. Tree wrapping is similar to a bandage left on your finger too long. If you are worried about the unlikely possibility of sunburn, it is much better to paint the trunk with a diluted latex paint that matches the color of the bark. White is OK too. Staking and guying is usually unnecessary if the tree has been planted properly with the proper earth ball size of at least 9" of ball for each 1" of trunk diameter. Staking is a waste of money and detrimental to the proper trunk development of the plant. In rare circumstances (sandy soil, tall evergreen trees, etc.) where the tree needs to be staked for a while, connect the guy wires as low on the trunk as possible and remove the stakes as soon as possible. Never leave them on more than one growing season. Temporary staking should be done with strong wire and metal eyebolts screwed into the trunk. Staking should only be done as a last resort - it is unsightly, expensive, adds to mowing and trimming costs, and restricts the tree's ability to develop tensile strength in the trunk and trunk diameter. It can also cause damage to the cambium layer. Remove all tags. It is very bad advice to prune at planting to compensate for the loss of roots during transplanting or planting. Most trees fare much better if all the limbs and foliage are left intact. The more foliage, the more food can be produced to build the root system. Even low limbs and foliage should be left on the tree for at least two growing seasons to aid root development. The health of the root system is the key to the overall health of the tree. The only trees that seem to respond positively to thinning at the time of transplanting are field-collected live oak, yaupon holly and a few other evergreens. Plants purchased in containers definitely need no pruning, and deciduous trees never need to be thinned. 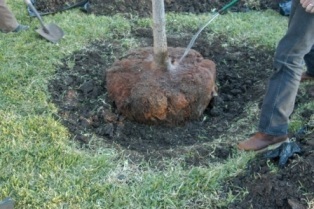 Mulch the top of the ball after planting with 1" of compost and then 3" of mulch tapering to 0" at the tree trunk. This step is important in lawn areas or in beds. Do not ever plant grass over the tree ball until the tree is established. People don't grow trees. Trees grow in spite of people. For the most part, trees are tough, durable and easy to plant and transplant if treated in a sensible and natural way.